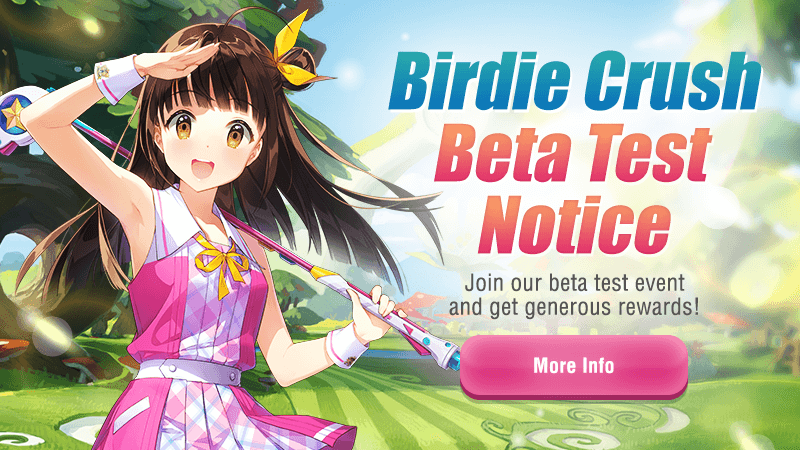 The beta test of Birdie Crush will begin now! Thank you all for showing your interest in Birdie Crush since the pre-registration. We hope you enjoy playing the game during the beta test period. Also, we will be holding various events to make your experience even more fun! So, don't forget to check out the notices in the game! Did you know that Birdie Crush is more fun when you play with your friends? I hope you're ready to play a round of golf with friends from all around the world! - You can play Birdie Crush with players from all around the world. - All play records and equipment you acquired from the beta test will reset after the test ends. - However, "Beta Test Exclusive School Uniforms" and "Fairy Lamp Golf Bag" will be given to those who complete Missions during the test period when the official service begins. We'll put up another notice with more details in near future. - Please note that Birdie Crush will be available on any OS when it's officially released. - Please note that the HIVE 1:1 inquiry will only be used as a method to collect your comments on bugs/issues during the beta test period, so there will be no response to your request during the period.